During this 2016-17 school year, our teachers, staff, administrators and Board have put laser focus on three key areas: academic growth, classroom innovation and Tiger care. This is how we are making strides right now in Preparing Our Students for Tomorrow, Today. Now, a group of Loveland parents, community members and business leaders have joined our educators, staff and administrators in developing our future goals. 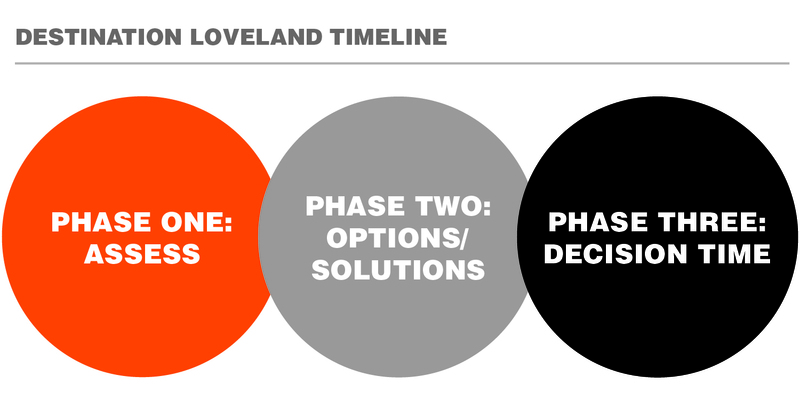 Called the Destination Loveland Task Force, this group is developing what the Loveland student experience should look like, the future needs of our facilities and a financial plan to achieve our goals. Here you can stay up to date as the task force progresses. We are excited for the future, and we appreciate your support. See the most recent Destination Loveland headlines! Now through the fall of 2017 task force members will examine the current student experience and existing facilities to determine future needs. Fall of 2017 the task force will present potential options/solutions to the Loveland Board of Education for consideration. The district will present the recommendation from the Board of Education to the Loveland community. Meet the DL Task Force Team! Have a question? Please contact District Office at (513) 683-5600, and let us know how we can assist you.